The Year of the Horse will dawn in less than a month and weeks before this, restaurants have already concocted their special Chinese New Year feasts. It’s always a busy never-ending feast during the lunar New Year celebrations. 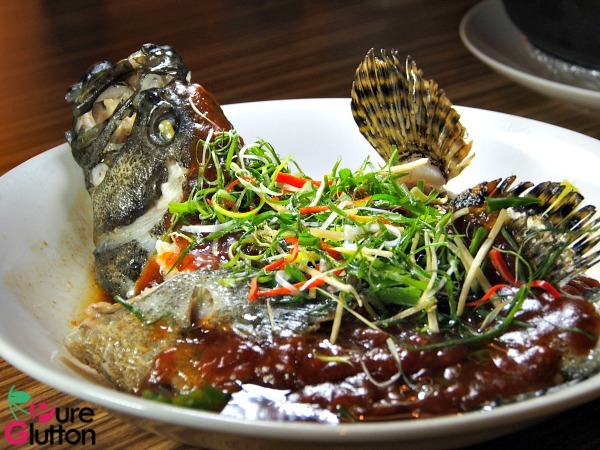 Private Kitchen in Damansara Uptown will be serving some special dishes at affordable pricing during the Chinese New Year. The meal of course starts with a yee sang and Private Kitchen’s version is the Prosperity Salmon/Jellyfish Yee Sang. Fish and prawns are must-order items as they have significance in Chinese greetings: fish denotes good tidings and prawns mimic laughter. I find the Steamed Tiger Garoupa in Special Sauce and Deep-fried Prawns with Longan coated Honey Sauce to be rather strong in flavours. The garoupa is very fresh – the fish is sweet with a firm bouncy texture and would have fared better with a lighter simpler sauce. 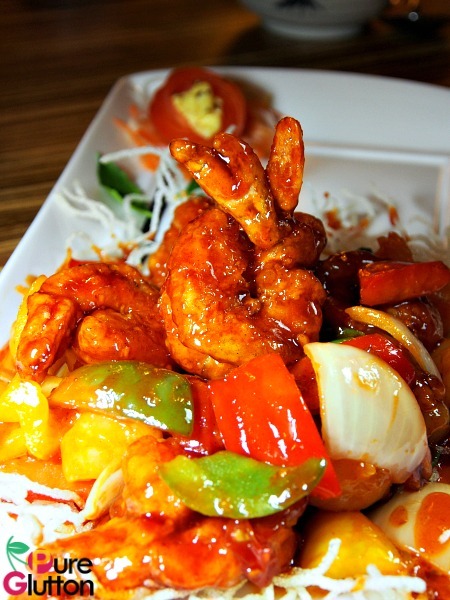 The prawns dish is similar to their signature Pork with longan honey sauce – prawns replaced the pork. These 2 dishes – the fish and the prawns would go well with white rice. While you have that bowl of white rice in front of you, the Braised Pork Belly in Casserole will induce you to call for a second bowl. 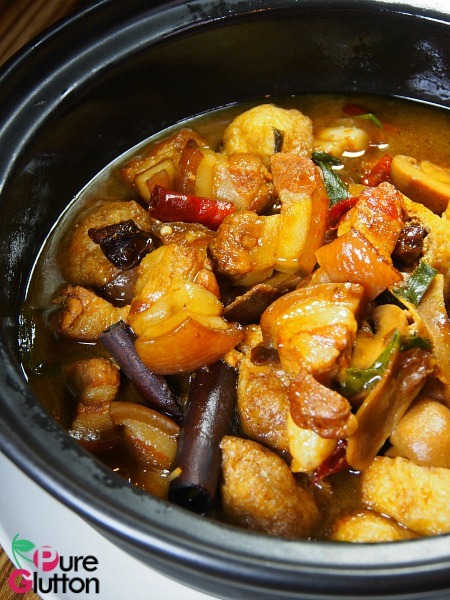 There are tofu puffs and mushrooms in the casserole with cinnamon sticks lending their unmistakable aroma and heat level boosted by some dried chillies. This dish is certainly not meant to be eaten on its own, as the thick gravy is bursting with robust flavours. 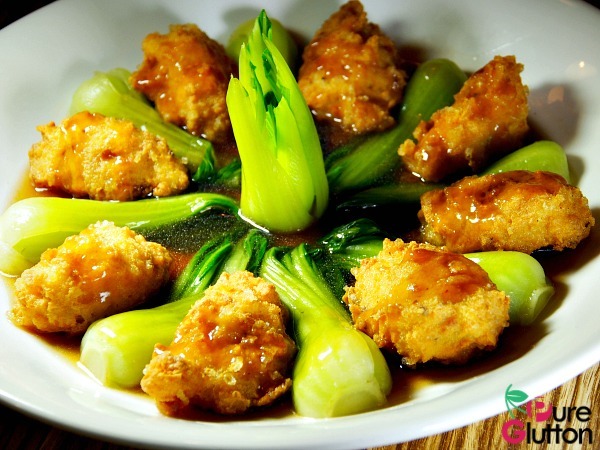 My favourites in this menu are the Special Stuffed Chicken with Assorted Mushrooms and Wok-fried Homemade Tofu with Minced Meat in Abalone Sauce. 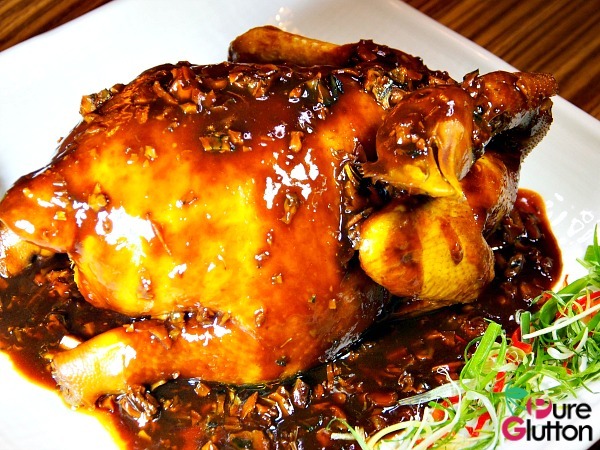 The plump glistening chicken is a sight to behold as it is doused with dark sauce with minced pork. 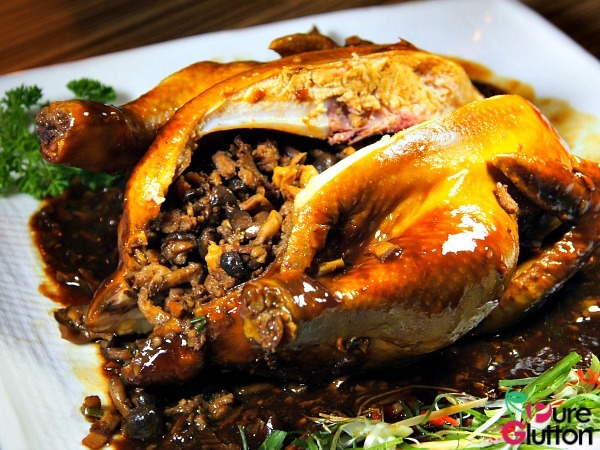 Once the chicken is split open, the stuffing of minced pork and diced assorted mushrooms tumbled out. I must say the stuffing goes very well with the smooth chicken. 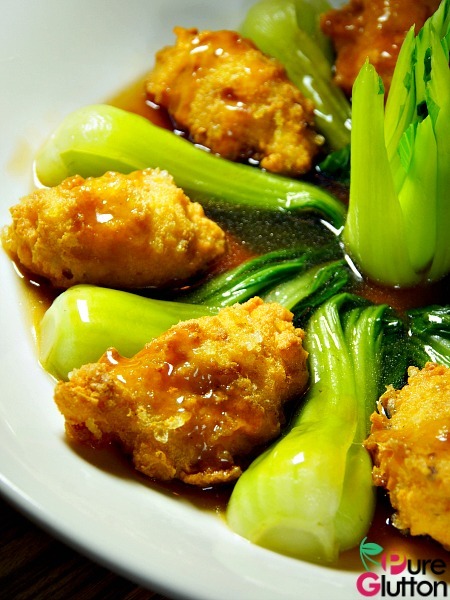 A paste of minced meat coats the smooth tofu and these are served with “siew pak choy” in a light abalone sauce. I’m glad the flavouring here is mild enough to somewhat balance out the more intense tastes of the earlier dishes. 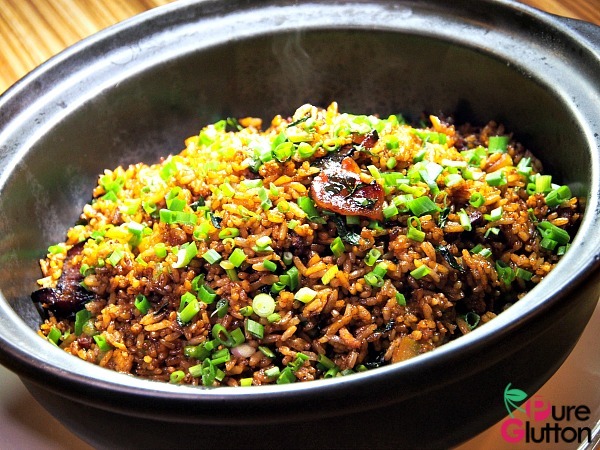 Do keep some stomach space for the Fried Rice with Preserved Meats and Mushrooms. Served steaming hot in a claypot, the rice is fragranced with shallots, spring onions and oils from the preserved meats. The earthenware pot keeps the rice nicely warm as we take our time chewing the well-fried rice infused with waxy smoky flavours, thanks to the famous Wing Chow brand of Chinese sausages, liver sausages and waxed pork. Dessert is a simple Red Bean Cream with Lotus Seeds. I like that the sugar level is kept low and the texture given a chewy bite with the addition of barley. This menu is priced at RM398+ for 5-7 pax and at RM698+ for 8-10 pax. Please note however that the smaller set doesn’t come with the fish. As the fish is of a standard size, the inclusion of this dish in the smaller set would be too much for 5-7 pax. Note: Private Kitchen will be relocating to a new premise at 20 Jalan SS2/10, Petaling Jaya sometime in March 2014. The last day of service in Damansara Uptown will be 17 February 2014.